Brimful Curiosities: Oh Say Can You Say? It's Dr. Seuss Day! Are you reading a Dr. Seuss book with your child today? It's NEA's Read Across America Day, an annual celebration that takes place on Dr. Seuss's birthday. We're giving our tongues a workout with the book, Oh Say Can You Say? It's a book full of silly tongue-twister poems. My daughter thinks it is hilarious when I make mistakes and read too fast. I can't wait until she's old enough to read it herself so she will look like the fool. 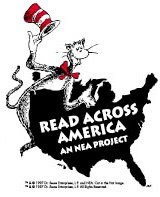 NEA's Read Across America 2010 Event & Activity Guide - includes word puzzles, mazes and more. Plus, sign up for the Seussville email newsletter at http://www.seussville.com/news/ between February 24, 2010 and April 30, 2010 to enter for a chance to win 10 Dr. Seuss books. I did a Seuss blog, and I didn't even know it was Seuss Day! Thanks for the reminder!